Speculation of closure and new design talent have surrounded perversely preppy brand Band of Outsiders since former talent agent-turned-designer Scott Sternberg was ousted from his own label in 2015. Before that turn of events, Sternberg had created a unique vision of sized down, slim-fit suits, polos, and other semi-nerdy, California-bred staples that found celebrity fans in everyone from Aziz Ansari to Frank Ocean and Donald Glover. However, celebrity co-signs aside, when Sternberg and the label faced financial concerns they deemed insurmountable (to the tune of $2 million in debt), CLCCA SA, a holding company based in Belgium, acquired them. The acquisition left open the possibility for a brand revival without its original founder on board. Neither fans nor industry insiders seemed to have any idea about what a new Band of Outsiders could look like, since the clothing Sternberg had designed for the label since 2004 was so closely tied to his personal aesthetic. Last night, however, all was revealed when the trio of designers who replaced him—Niklaus Hodel, Matthias Weber, and Florian Feder—unveiled their new vision for Band of Outsiders Los Angeles with their Spring 2017 runway show during New York Fashion Week that served as the official relaunch. Given their collective pedigree in fashion design—which includes gigs at luxury houses like Louis Vuitton and fast fashion empires like H&M, as well as their own four year stint designing shoes together under the brand name WHF—the three men were expected to deliver. 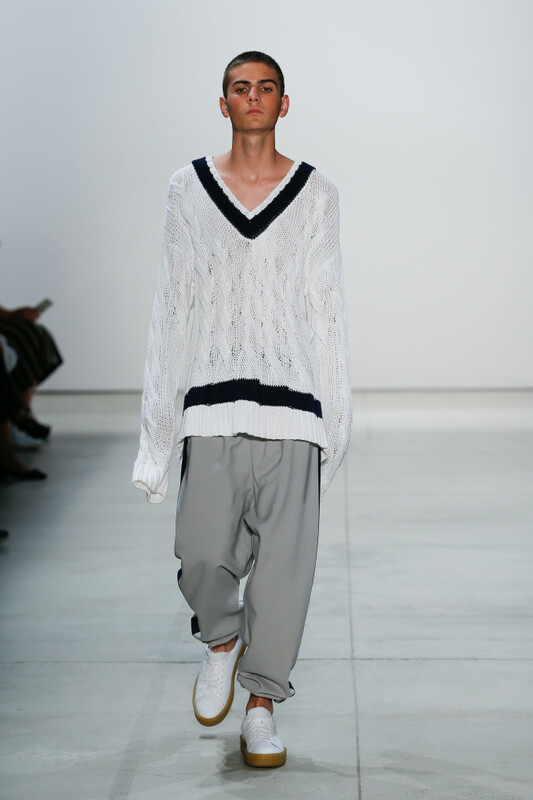 The resulting clothes, shoes, and overall vibe are entirely different than what we knew of Band of Outsiders. Even the company&apos;s name underwent a bit of change with the addition of “Los Angeles” tacked to the end. This iteration of West Coast style removed Sternberg’s favorite preppy staples like critter pants and tailored navy blazers, and swapped them with small, more subtle nods to prep, like plaid robes and mesh jerseys with repp stripe detailing. The sizing was generous, too, giving guys much more room to breathe. While the old Band of Outsiders was known for its shrunken fits and 1 through 6 sizing, the new Band man is much more relaxed. This was displayed best in a pair of trousers that featured a tear-away function, as well as a pair of white low-top, gum sole sneakers shown with every look. What the collection lacked in an aggressive point of view was made up for in practicality. 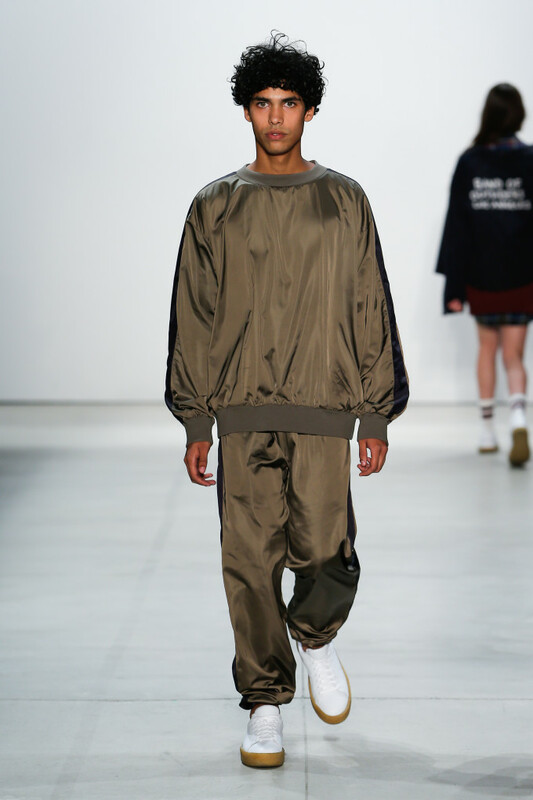 These clothes are wearable, and, as indicated in the designers’ show notes, they were inspired by true “outsiders,” rather than a rowdy gang of rebellious prep schoolers sporting tight pants with very deep pockets.